I’ve been using a FURminator on Ellie, who is the best dog, for seven years now. While the brand instills immediate decision fatigue with way too many products to choose from these days, once you’ve... combed through the options, they’re still the best. Ellie hates being brushed, and the FURminator means it has to be done a lot less often. 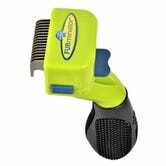 The FURminator doesn’t just smooth the fur, it does some light thinning, and gets at the undercoat as well as the top- better for pet, your furniture, your grooming bill, and your allergies. Having taken a fresh look at their lineup, I’m also going to check out their deMatter (which sounds like a late-game spell from Final Fantasy VI), since Ellie inevitably gets mats around her ears.